I have a HUGE crush on Spider Gwen's desgin. Have some Spiderwoman Asami and Spider Gwen Korra C: After this I'm fairly certain I won't be able to submit on time. :’C Keep praying for my soul. Spud Mako and Candy Corn Bolin cameo. Two of my favorite characters dress up as my favorite Marvel characters! Thank you, Katantoon! OMG its so fluffy I might die! and Mako is a potato. A giant freakin potato. It's a great superhero name. Both gals look great! I love the design as well and it's thanks to the design and overall that Edge of the Spider-Verse #2 that got me into comics as well. Thank you! Her design is amazing~ It's not like the rest of the superheroes we have and yay for comics! Yeah, but where's Mako's costume? 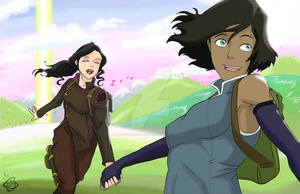 We all knew he was the dull potato... oh well, at least this Halloween Korra has an excuse to get her hands 'sticky'! Right now, Not yet. But soon, not here in DA though. When Ill do one, it will be in tumblr.